20th Century Fox recently released details for the upcoming DVD, Blu-Ray & 3D Blu-Ray release of "The Martian". 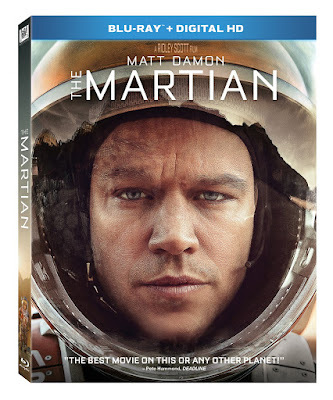 The film stars Matt Damon, Jessica Chastain, Jeff Daniels, Chiwetel Ejiofor, Kristen Wiig, Kate Mara and Sean Bean. Special features on the DVD and Blu-Ray includes Signal Acquired: Writing and Direction, Occupy Mars: Casting and Costumes, 5 Theatrical In-World Pieces, Ares III: Refocused, Gag Reel and Production Diary. "The Martin" hits retail on January 12th.